The centrepiece of this immense park is Etosha Pan, a 5,000 sq km flat dustbowl, denuded of vegetation, than transforms into a vast shallow lake during the rainy season. The park is at its best, however, in the dry season, when the pan dries up and a series of fringing waterhole form the only source of drinking water for miles around, attracting prolific herds of wildlife, and providing easy snapping for keen wildlife photographers. A feature of Etosha that appealed to me is that the combination of affordable rest camps and good roads means it is one of the few great African parks easily explored on a self-drive basis. The wildlife is also very impressive and I had great sightings of black rhino, lion and elephant, despite visiting in the wet season, when animals tend to disperse outside the park’s boundaries. It was also exciting to see the black-faced impala, a distinctive subspecies endemic to the Namibia/Angola border area, and whose global population is estimated at around 1,000. Namibia’s flagship park, Etosha, is easily one of the finest places in the world to watch wildlife, and one of my personal favourites. I’d recommend spending several days here. The park’s dominant feature is the 120-km wide Etosha Pan, a dramatic swathe of sunbaked salt fringed by unspoilt bush. Around the pan are waterholes, some of them man-made, which attract elephants, giraffes, antelopes, zebras and ostriches in impressive numbers. One waterhole, Okaukuejo in the southwest, is floodlit after dark; black rhinos sometimes drink here. Hyenas and lions are also frequently seen. The surrounding woodland harbours owls, falcons, warblers, hornbills and a host of other birds. It’s a straightforward five-hour drive from Windhoek to Etosha, making this an easy destination for self-drive travellers as well as those on guided tours. There’s a good variety of accommodation both inside and outside the park. But what really sets Etosha apart from other top safari destinations is the fact that, despite its accessibility and allure, overcrowding is rarely a problem. 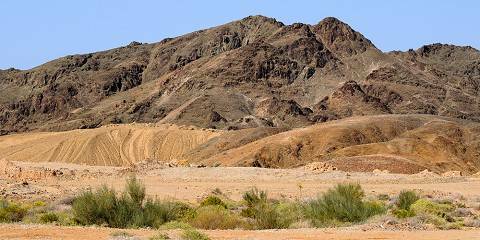 The national park comprises the vast pan surrounded by a gigantic chunk of arid wilderness in central-northern Namibia. Etosha means ‘The Great White Place’ and this is an extremely apt description for the bleached landscapes of shimmering heat that dominate Namibia’s premier wildlife-viewing destination. In my humble opinion, there are few places that can rival the Okaukuejo Camp waterhole during the dry season for animal sightings. I love this place where you can sit quietly on a bench overlooking the local waterhole and enjoy world-class game-viewing day and night. On one particularly good evening in early November, I counted 17 black rhino, 2 white rhino, countless herds of elephant, giraffe and general game in the space of just three magical hours. The coup de grace was watching a pride of lions stroll into the midst of this wildlife mecca and pull down a giraffe right in front of us! There is no disputing that Etosha is one of the best wildlife-viewing locations in all of Africa: a game-rich wilderness that stands proudly amongst the continent’s finest national parks. If you visit once, you’ll surely come back for more. As a photographer, I’ve often looked longingly at the numerous excellent wildlife images taken in Etosha National Park. In many cases you don’t even have to read the caption; Etosha pictures tend to be quite distinctive. The white bleached calcite soil is a good give away and I guess there are few places where such numbers and variety of animals can be seen at any time at a waterhole. I went to Etosha in the middle of the rainy season and I didn’t get to see any of that. As can be expected, wildlife was very dispersed and the grass was long. Sitting at waterholes, which would normally be the way to work Etosha National Park, proofed to be a waste of time. I still had some good sightings: the very active jackals were a pleasure to watch and the birding was great with black korhaans showing off their mating displays. The very localized black-faced impala and Damara dik-dik were all over the place. My highlight was a black-rhino, which allowed me to watch her without running towards or away from me, as most black rhino tend to do. I guess, another place I need to get back to sometime. Etosha is a “must-see” on any trip to Namibia. Covering nearly 23,000 sq km, almost a quarter of which is the silvery Etosha Pan, it’s home to over a hundred species of animals including most of the Big Five (except for buffalo) and is one of the best places to see the endangered black rhino. One magical evening at Okakuejo Rest Camp, sipping a glass of wine, we watched a black rhino and a white rhino drinking at the floodlit waterhole, both with tiny calves. Ten minutes later, two lionesses arrived followed by five playful cubs. Etosha is the perfect destination for first time self-drivers. We spent three days there using the Park’s excellent maps, routes were clearly marked and we would park by waterholes waiting for wildlife to come to us. If this is to be your first self-drive, take a good field guide with you - although self-driving allows a lot of independence, you might miss the expert knowledge of driver/guides. It is possible to book guided game drives at the rest camps, so you could have the best of both worlds. Etosha – “the Great White Place” – is the ghost of a lake that died 12 million years ago; a shallow depression 81 miles long and 45 miles wide, covered with salt crystals so bright they hurt they eye. For most of the years it is as dead as Mars, but the rains bring Etosha back to life. For a few brief weeks it becomes a lake again, its shores thronged with pelicans and candyfloss clouds of flamingos. Yet even at the height of the dry season the surrounding plains and woodlands conceal springs and waterholes whose presence pulls in constant processions of thirsty animals. Here with luck you can see four of the Big Five (no buffalo) as well as cheetah, giraffe, zebra, gemsbok, kudu and other plains game including the rare black-faced impala. One of the most rewarding areas for birding is Fischer’s Pan, near the romantic old Beau Geste fort of Namutoni. Since 1958 Namutoni has been a rest camp like Halali and Okaukuejo on the southern fringes of Etosha Pan. Two other places you might wish to consider staying at are Onkoshi, a new camp with stunning views across the Pan that opened in 2008, and Dolomite Camp (new this year) in the “restricted access” area of western Etosha. My personal favourite is Ongava Tented Camp, set in a 300-sq. km wildlife reserve on the southern edge of the park. Maybe it’s because I saw an aardvark here in broad daylight! Etosha is centred on a pan – a white, featureless, dry salt-bed that shimmers into distant horizons. The real beauty of this unique park lies in the ease of its wildlife viewing – sighting here are virtually guaranteed. Animals congregate around waterholes and it's a case of putting your feet up and letting the wildlife come to you. I saw an intriguing collection of herd animals around the hole that I staked out, including the elegant gemsbok, wildebeest, springbok, and elephants. Also in the park are giraffe often seen as silhouettes travelling across the flat plains here in search of food. But Etosha's biggest delight is the black rhino. One of Africa's rarest mammals, I saw two at night at a waterhole close to an official camp. I was alone when I saw a large female emerge from the bush - she was joined a short time later by another and they had play fights around the water. It was one of my great wildlife highlights of Africa. Etosha’s harsh landscape is not to everyone’s taste: the wilderness of dusty, rubble-strewn thorn scrub surrounding the vast, featureless salt pan is impressive rather than beautiful. The wildlife, however, is consistently outstanding and includes numerous elephant, large antelope herds and plentiful predators. The action concentrates on the spring-fed waterholes around the edge of the pan, which attract heavy traffic – both animal and human – during the dry season peak. Viewing is often best from camp: over a memorable 24 hours at the Halali waterhole, I watched a constant stream of thirsty zebra, springbok, oryx and kudu arrive by day, followed by elephant, black rhino, lion, hyena and leopard after dark. Fascinating interactions make it hard to tear yourself away, and you might just witness a lion kill. The terrain is too dry for some species, including hippo and buffalo, but ideal for many arid country specialists, from brown hyena to pale chanting goshawk. After the rains, animals disperse and sightings become harder, but the lush new growth triggers a mass springbok lambing, and flamingos flock to the shallows of Fischer’s Pan. Etosha National Park centres on a vast, normally bone-dry, lake bed. Around this stretch miles of burnt grasslands and dry woodlands. It’s not the most promising sounding of safari destinations and most people would assume that the best time to visit, if at all, would be in the wet season when the shallow lake fills with water but yet, despite this relative abundance of water, the wet season isn’t the best time to experience Etosha as the easier access to water means the animals can spread out over a wider area. Come in the dry season though and things are very different. Huge numbers of animals of all shapes and sizes congregate around water holes: elephants, rhinos, giraffes, lions and endless zebra, oryx, kudu and springbok mean that the wildlife viewing is simply superb. 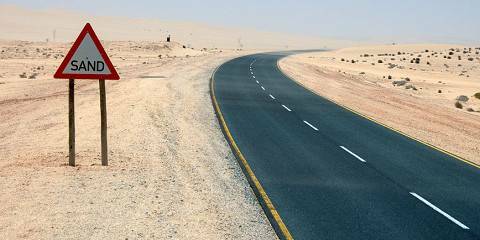 To add to this other huge plus points for Etosha are the ease of access, the decent road system and, compared to East Africa or Botswana, very affordable accommodation. All of this makes a self-drive budget safari to Etosha an easy and enjoyable prospect. In fact, this is arguably one of the best parks in Africa for a first – or tenth – safari. Etosha National Park is an undisputed big game heavyweight that stands in the same league as South Africa’s Kruger and Tanzania’s Serengeti. At nearly 23,000 sq km, it’s in fact bigger than both those contemporaries, but the density of game is just as astonishing. With the exception of buffalo, the Big 5 are all here. There’s probably nowhere better in Africa to see black rhinos. I’ve seen more lions here than anywhere else except the Serengeti. And to my mind the elephants are the biggest I’ve ever seen. For the big game, Etosha is best visited in the cooler and bone dry winter months (roughly between May and October), when the waterholes become a bustling oasis in the otherwise parched landscape. The floodlit waterhole at the centrally-located Okaukuejo Camp is a special feature, though the camp itself, like various others in the park, is in need of a facelift. Personally, I prefer the greener, hillier and less-visited western section of the park, which is a very good bet for black rhino sightings and the rare black-faced impala. This is one of my favourite parks in all of Africa. It was here that my children saw their first lions, gorging on a kill by a waterhole as gemsbok and impala watched nervously from the shallows nearby. Black rhinos, too, cavorting with one another at the waterholes at night, just like in Sir David Attenborough’s Africa series. 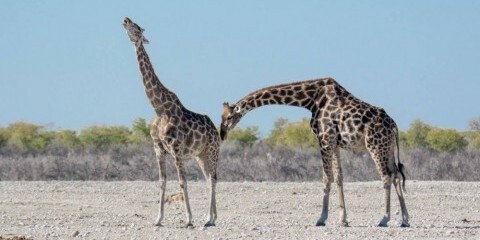 Giraffes drinking as only giraffes can. 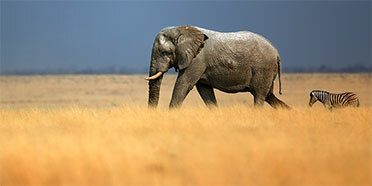 Elephants turned ghostly white by the chalk-like dry season dust of Etosha. But in Etosha, for me it’s not just about wildlife, although that’s my primary barometer for any park. Instead it’s the combination of accessibility (most of the wildlife is easily accessible from the main campsites) with remoteness (it’s not difficult to escape the crowds). And I love the salt pans for their suggestion of eternity. On my last visit, I particularly enjoyed the park’s western reaches, which have only been opened to the public relatively recently. Four of the Big Five inhabit Namibia's premier National Park (no buffalo), along with hyena, cheetah, bat-eared fox and honey badger, among others. Antelope can be spotted from afar on the sparsely vegetated, flat 'sandscape' whose dusty roads stretch far into the distance. In this arid park, animals congregate around the many waterholes, a great place to set up your camera and picnic for an afternoon. Some waterholes are easily accessible from camps and watching for animals at a floodlit pool after dark was a park highlight, even if we didn't really see much. Instead, we turned our eyes skywards and enjoyed a safari of the celestial kind. Etosha means ‘Great White Place’ in the Herero language after the giant, parched and dazzlingly white Etosha Pan. I find this the perfect environment for silhouetting the animals – a lone wildebeest or herd of handsome gemsbok can be seen slowly crossing it or just standing as if mesmerised. The other highlight for me is the dozens of waterholes; ideal places to sit and watch a veritable 'Noah's Ark' of species queue up to drink – skittish black-faced impala, giraffe comically bending towards the water, or a herd of thirsty elephant steadfastly marching over the horizon. I’ve always had the greatest of luck at the Okaukuejo floodlit waterhole. To see a pride of lion or a family of rhino amble from the darkness with their darting eyes glinting red or green in the eerie white light of the spotlights is a special treat. It’s no wonder people end up staying here all night. Set against a backdrop of harsh, foreboding scrubland and covering more than 20,000 square kilometres, Etosha offers exceptional wildlife viewing. Unlike other safari destinations in Africa, wildlife sightings here are virtually guaranteed. Centred on a huge, flat shimmering salt pan, the park is dotted with more than 30 waterholes, both natural and man-made, which attract a daily array of animals and birds. Having entered the park from the western Von Lindequist Gate, we found Chudop the most consistent and prolific. The best time for wildlife viewing is of course early morning and late afternoon, but during the dry months from June to November you’ll find more activity around the waterholes throughout the day. My best advice is to find a good spot by the water and be prepared to wait as the animals at first slowly and then in numbers drift in from the desert plains. You’ll find no shortage of zebra, giraffe, springbok and gemsbok – we also easily spied elephant, lion and hyena. In fact, our animal wish list was getting ticked off quickly, but it was the black rhino which proved most elusive. That was, until the very last day when a determined rhino barrelled out of the thick bush behind us almost colliding with our vehicle as we were driving out of the park and disappeared just as quickly into the bush on the other side of the road. Oh well, perhaps on our next visit! Etosha is Namibia’s jewel in the crown and should be on everyone’s itinerary when visiting this alluring country. Etosha means “great white place” and the vast calcrete pan dominates the reserve. Etosha is a photographer’s dream with the shimmering pan, golden grass and lilac-hued skies. In the dry season, there is lots of game with many elephant, zebra, gemsbok, lion and perhaps most special of all, black rhino. The dry season is particularly rewarding when a non-stop procession of animals visit the water holes, and you can spend hours just sitting in one place. The water holes in the public rest camps are illuminated at night, and it is magical sitting there waiting to see what will step out of the shadows onto the flood-lit stage. I’ve also visited in the wet season, and although I only saw a single elephant, the pan was flooded and covered with pink flamingos. I will never forget watching the flamingos “dance”, strutting in formation to the left and right, like American line-dancers.